Investment planning is now more of a science than an art. Technology, ever-increasing investment opportunities and stricter regulation have all encouraged a more scientific approach. But has your investment strategy kept pace? 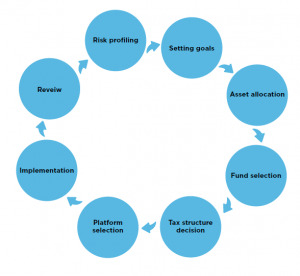 Investment planning and asset allocation is a multi-stage process. The actual execution of investment transactions is virtually instantaneous, but the decisions behind them need time and should not be hurried. There are many different approaches to the investment planning and asset allocation process, but most will broadly follow the step-by-step framework explained in this guide. When should you review your plans? Your investment holdings have not been reviewed in the past year. Your financial objectives have changed since your holdings were last reviewed or are likely to do so in the near future. You are still holding funds that you bought more than ten years ago, such as those purchased in an early individual savings account (ISA). You have inherited investments that were simply added to your portfolio without review. The investments underpinning your pension arrangements have not been considered in setting your investment strategy. Planning point – The investment planning process will help you understand your investment plans and regularly track their performances. So, it is worth taking the time to understand how it works. The value of your investment can go down as well as up and you may not get back the full amount you invested. Past performance is not a reliable indicator of future performance. Investing in stocks and shares should be regarded as a long-term investment and should fit in with your overall attitude to risk and your financial circumstances. Risk is at the heart of many investment decisions and, as the diagram above shows, it is typically at the starting point of the investment planning process. There could be several types of risk in any investment. Helping you to understand the risks is a key responsibility of your investment adviser. You should never be in the position of saying ‘I didn’t know that could happen’. Deposit rates are at a historically low level – the base rate was cut to 5% in March 2009 and, after a brief post- referendum dip to 0.25%, returned to 0.5% in November 2017, finally increasing again to 0.75% in August 2018. 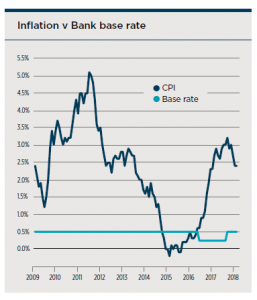 For nearly all the period since March 2009, inflation has been higher than base rate, at times by more than 4%. The post-referendum economic uncertainty means that the Bank of England’s oft-repeated standpoint is that, “any future increases in Bank Rate are expected to be at a gradual pace and to a limited extent”. Thus, a rapid rise in rates is unlikely even though inflation has been above the Bank’s 2% target since February 2017. In theory, the higher the investment risk you are prepared to accept, the greater your potential returns. However, a higher return from higher risk is not a certainty; if it were, there would be no risk. While the process of portfolio construction now includes sophisticated strategies to reduce risk, it cannot be eliminated. Planning point – Identifying what you want to achieve with your investments is the first step in putting together your strategy. Without this goal-setting, you may not make best use of your capital in the short or long term. You would not start on a journey without knowing where you want to go. The same principle applies to investment planning: you need to decide what you are trying to achieve with your capital before making any investment. For example, you might want to produce a specific level of income or aim for a capital sum at a future date. Different investment objectives require different strategies. Those objectives need to be realistic: if you want a high income, you cannot also expect similarly high capital growth. Also, you need to be comfortable with the goals you have set and stick with them until your circumstances prompt a change. If your aim is long-term capital growth, then you should not expect to outperform deposit returns every month. Goals should not be changed retrospectively any more than investments can be made with the benefit of hindsight. Instead, new goals can be set during a review. At the goal-setting stage you also need to consider whether there are any ethical considerations you wish to place on your investments. The environmental, social and governance (ESG) aspects of investment have become increasingly relevant to individual and institutional investors. As at September 2018, there was £16.9 billion invested in UK ethical retail funds according to the Investment Association (IA). The level of risk you are prepared to accept. The assessment of your risk tolerance is now usually carried out with the help of a series of profiling questions, which may be in the form of a computerised questionnaire. The level of capital loss that your finances can absorb. You may feel comfortable about taking a high-risk approach to your investments, but that does not automatically mean you should invest in volatile assets. The greater the risk, the greater the possibility of a substantial loss. Unless you have sufficient resources to cope with potential significant loss, you should not expose yourself to the risk. Your adviser will assess your loss capacity, based on a detailed analysis of your assets and liabilities through the investment term. The result of that exercise could mean your recommended portfolio has a lower level of risk than your attitude to risk alone suggests would be appropriate. Planning point – Investment markets can be very volatile, especially in the short term. There are no guarantees a high- performing fund will repeat its success in the future. There is considerable academic research to show that asset allocation is a crucial factor in determining overall investment returns. This is well illustrated by looking at the Investment Association sector fund performance over various terms. The table below shows results across five calendar years. Asset allocation is not just about picking asset sectors. As the table shows, the top sectors are often at the more volatile, higher end of the risk scale such as the smaller companies sectors. 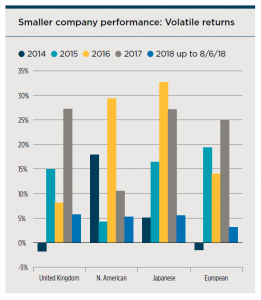 The volatility of smaller company performance is well demonstrated in the graph. The asset allocation decision is especially important in the management of risk. Diversifying across different asset classes, such as UK shares, foreign shares, fixed interest securities, property and commodities, can reduce your investment portfolio’s volatility. What is bad news for one asset class might be good news for another. For example, a jump in inflation can be negative for fixed interest securities, but it may be positive for index-linked government bonds. The same can hold true for individual shares. For instance, the rising price of oil throughout 2018 has proved to be bad news for airlines, such as easyJet, but better news for the major oil companies, such as Shell. 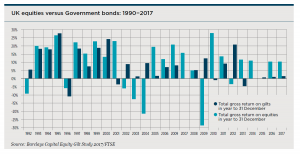 An example of the differing fortunes of two main UK asset classes – equities and government bonds (gilts) – is shown in the graph below. In most years, both asset classes have moved in much the same direction, if not to the same degree, but there have been notable exceptions. This was particularly the case during the financial crisis of 2008 to 2009 when first gilts outperformed strongly and then, in the following year, equities did so. The process of matching asset allocation to your risk profile and investment goals is now one that can rely on computing power. This allows a portfolio to be constructed that takes account of the historic performance relationships or correlations between asset classes. As the graph above shows, gilts and equities often move in the opposite direction– a negative correlation. 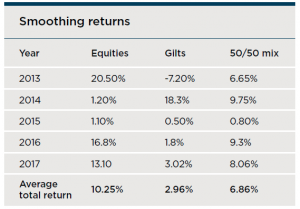 Therefore, a 50/50 combination of equities and gilts frequently produces more stable returns than either class alone. In the five years to the end of 2017, the 50/50 mix provided a return just over midway between the two classes with much less volatility. Planning point – A diverse investment portfolio can help mitigate the risks of volatility in individual sectors. Past performance is not a guide to the amount you will receive in the future. Once the asset allocation has been set, the next decision is how to invest in the selected asset classes. For most private investors, that will mean using collective funds, such as unit trusts and open-ended investment companies (OEICs). The direct purchase of assets may not make sense because of the costs involved and/or the difficulty of achieving an adequate spread within the asset class. Even for the wealthiest private investors, collective funds may be the only option for some asset classes, such as commercial property. Adopted an unacceptably high-risk strategy. Performed well while the fund was small, but may now be much larger and less flexible. Recently lost its lead manager to another investment group. Just struck lucky. The fact is that luck can play a role in fund performance, particularly for more concentrated funds that have few relatively large holdings. The uncertainties about future fund performance have prompted the increased use of index-tracking funds. They are often called ‘passive’ funds to distinguish them from ‘active’ funds where decisions are made by an investment team rather than an index setter. Proponents of active fund management argue that an index fund should deliver returns slightly below the market index it is tracking, because of the effect of charges, whereas an active fund, without index constraints, can outperform. Passive fund managers accept this point, but argue that picking next year’s outperforming fund is virtually impossible and that overall, the higher costs associated by active funds more than counter their supposed performance benefits. For both passive and active funds, selection involves an in-depth analysis of a variety of performance statistics. But it also requires a qualitative assessment of the fund manager. Even funds tracking the same index have differing returns. For active fund selection, it is also necessary to investigate the manager’s investment process. Planning point – There is a wealth of information on fund performance available to investors. With some research you can build a greater understanding of how and why a fund may succeed. Tax is not always directly relevant to the design of an investment portfolio and should never dictate an investment decision. If tax saving is the sole motivation for your investment, then warning bells should sound. History is littered with tax-efficient, loss-making investment schemes. However, once the choice of asset classes and funds has been made, your personal tax position does become relevant in determining the structure – sometimes referred to as a ‘wrapper’ – in which you should hold the investments. For instance, you could hold the same investment fund directly, or in an individual savings account (ISA), or in a self-invested personal pension (SIPP) or in an investment bond. You can add a LISA (Lifetime ISA) to this list if you are under age 40. The tax consequences of each option are different. There are two layers of tax treatment to consider – within the chosen investment wrapper and then your personal position when you take withdrawals from it – unless you choose to hold the investments directly. The use of a variety of wrappers need not add great complexity to the management of your portfolio, as we explain in the next section. Some investments are better suited to being held in tax wrappers rather than directly. For example, income from fixed-interest funds is free of UK tax in an ISA, but currently taxed at rates of up to 45% if held personally. The construction and management of fund-based investment portfolios is now largely undertaken using investment platforms. At its simplest, an investment platform provides a means of assembling and administering a spread of different funds from a range of investment managers, which can be held in a variety of tax structures. Choice of funds and investment managers – generally the more the better. Range of tax structures available. Provider’s record for administrative efficiency. Level of fees charged and their collection method. Financial strength of the platform provider. Planning point – your investment plan needs to be dynamic and respond to changes in performance and values, as well as your requirement. So, you should regularly review your portfolio. The selection of the platform providers is the final step before the creation of your investment portfolio, but it is by no means the end of the process. Your investment plan should never be fixed or incapable of change. It needs to be regularly reviewed to check that both the asset allocation and chosen investments are still appropriate to your financial goals and that those goals have not altered. A review that makes no changes is rare. For example, to maintain the original asset allocation there will often be a need to rebalance holdings because of intervening moves in investment values. At the fund level, manager changes, revised fund objectives or disappointing performance can all prompt adjustments. New investment opportunities also need to be considered. If your portfolio is not subject to regular and systematic reviews, it may soon become just a random collection of investments rather than a coherent portfolio. The discipline of a regular review is therefore a key component of successful investment planning. The value of your investments and income from them may go down and you may not get back the original amount invested. Past performance is not a reliable indicator of future performance. Investing in shares should be regarded as a long-term investment and should fit in with your overall attitude to risk and your financial circumstances. Tax planning is not regulated by the Financial Conduct Authority. This publication is for general information only and is not intended to be advice to any specific person. You are recommended to seek competent professional advice before taking or refraining from taking any action on the basis of the contents of this publication. The Financial Conduct Authority (FCA) does not regulate tax advice, so it is outside the investment protection rules of the Financial Services and Markets Act and the Financial Services Compensation Scheme. This publication represents our understanding of law and HM Revenue & Customs practice as at 11 November 2018 and the proposals in the Autumn 2018 Budget.